Published Jun 6, 2011 by Peachpit Press. Part of the Learn by Video series. This innovative product uses interactive video to explain everything a beginner needs to know to create polished-looking videos with iMovie 11, from importing and organizing video files to using special effects like Green Screen, which lets you superimpose video footage of a person onto any background you want. Users will learn how to adjust the color of video clips, stabilize shakiness, and use Themes--which give a project special transitions, titles, and graphics. A major component is learning to build a movie by assembling and editing clips, and users will learn various ways to share their finished movie, such as creating a DVD and sharing online. Experienced instructor Maxim Jago presents 3 hours of exceptional quality video tutorials, complete with lesson files, assessment quizzes, and review materials. The video is wrapped in a unique interface that allows the viewer to jump to any topic and also bookmark individual sections for later review. 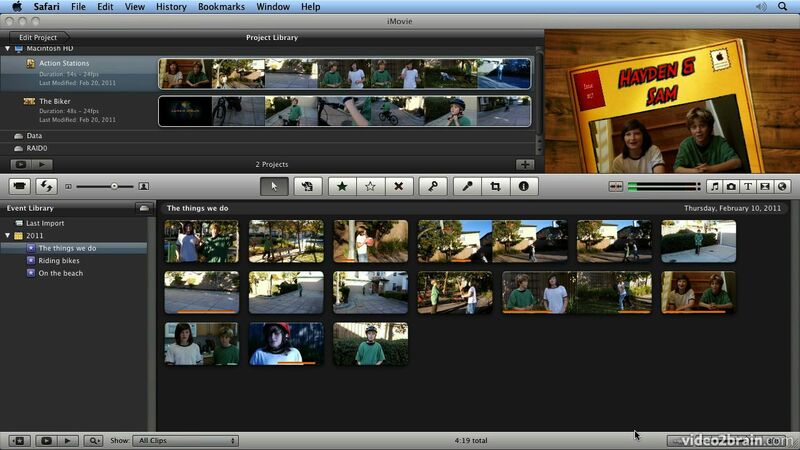 The unique Watch-and-Work mode shrinks the video into a small window to allow the student to work alongside in iMovie. Project files used in the lessons are included on the disc so viewers can practice what they've learned, and interactive review questions help reinforce freshly gained knowledge.